A.D Condominium floor 5 room 523 near Wong Amat Beach, Naklua. Studio with bathroom, kitchen, balcony, sea view. 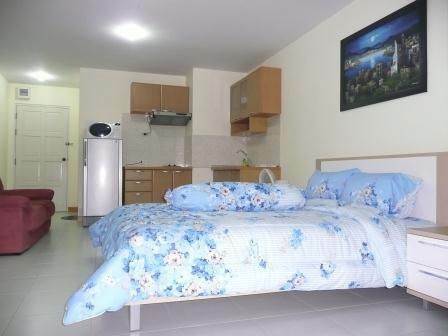 Reception, swimming pool, under-cover parking, 24 hour security, key-card access, laundry, shop. Balcony with sliding door, mosquito shield and ceiling fan. Air con, fridge/freezer, electronic safe. 32 inch plasma TV, DVD player. Bathroom fitted with bath, shower, shower curtain, ventilator and shaver plug socket. A fully equipped fitted kitchen with Formica surface, 2 hotplates, hood/extractor. Thai company ownership. Our reference WAC1000.